The bell chamber in this tower contains a ring of 12 bells (tenor 59 cwt 1qtr 23lbs in Bb) with a flat sixth and an extra treble to make a light ten (tenor 24-3-0 in Eb) and a full carillon of 35 bells (tenor 23-3-19 in D). 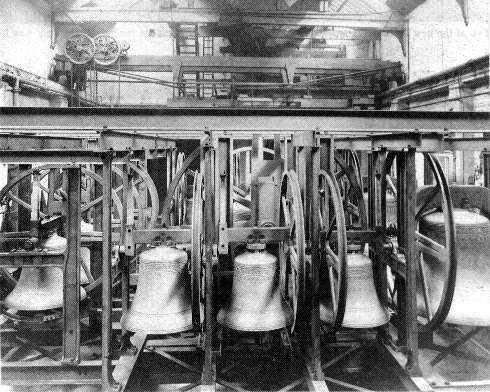 That the present ring of bells were installed was largely due to the efforts of Canon Nolloth, who had previously been connected with the installation of the ring of 10, tenor 41cwt in C, at Beverley Minster in 1901. The previous ring of bells at York Minster were considered unsatisfactory and were recast at the foundry of John Taylor & Co., Loughborough, in 1925. Hung above the ringing peal are the carillon bells. These are played by one person using the klavier (similar to a keyboard) from the ringing chamber. This arrangement allows melodies to be played in a similar fashion to how a piano operates. In a piano, when a key is pressed a hammer hits a string to prodcue a note. When a key is pressed on the carillon however, a series of mechanisms causes the clapper to strike against a bell and produce the note. 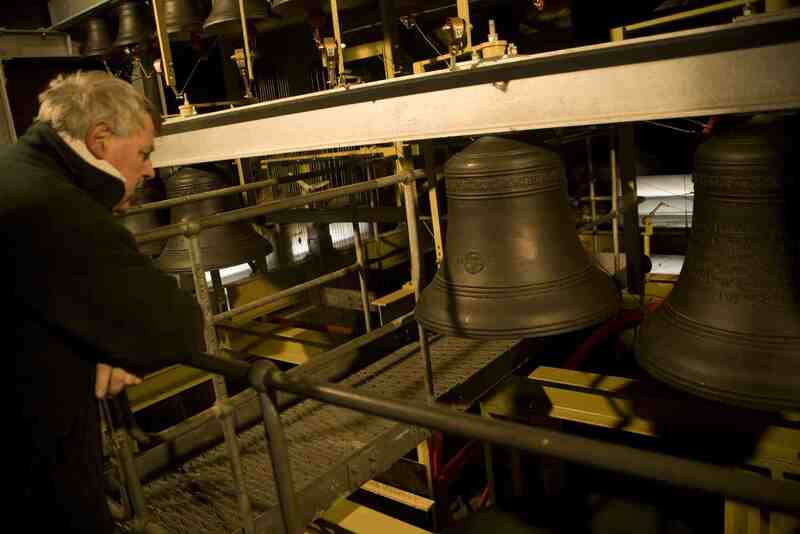 The carillon at York Minster comprises 35 bells, all cast by Taylors / Taylors Eayre & Smith of Loughborough. 11 of these bells originally resided at St Mary’s Church, Nelson (Lancashire) and were transferred to York in 1989. From this date until 2008, the Nelson bells formed a ‘chime’ – a similar system to the current carillon, though limited by the number of notes. 24 additional bells were added in 2008, together with a new frame, fixtures, fittings and transmission system along with the klavier from which the bells are played. This allows a far wider range of music to be played than was previously possible.